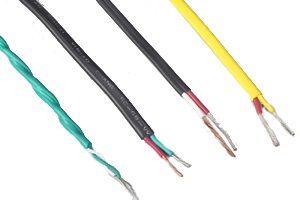 PVC Multi Pair Thermocouple Wire may be used in the transmission of telephone or other signals. 20 gauge solid thermocouple alloy. Extruded high temperature 105°C PVC insulation. Color coded twisted pairs, numbered sequentially for easy identification. Matched pairs are twisted to reduce the amount of electromagnetic interference. Flame retardant PVC jacket with ripcord. On individually shielded pairs the shields are isolated from each other.